The pipe rupture safety device in the gas tanks of our test vehicles sometimes triggers under unclear circumstances. This leads to a loss of range or to an undefined situation which is not desired by the client. Troubleshooting and fault analysis, understanding physics, deriving recommendations for either the design of the burst pipe safety device or the mode of operation. During the test phase of vehicles with gas tanks, our client was able to detect faults that seemed inexplicable. Under unclear circumstances, the pipe rupture safety device tripped and closed individual gas tanks – without, however, breaking a line. Our task was to search for the fault, analyze it and find a solution together with the supplier and the colleagues from the operational strategy. In this project, the aim was to check and prove on the prototype which optimization possibilities existed in order to set up a series development project. 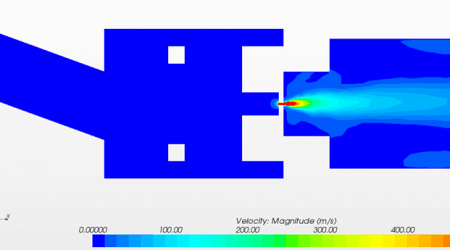 With the help of CFD simulations of the pipe rupture safety device, we were able to show that the tolerance of the spring in combination with rarely occurring but physically plausible scenarios had led to the error. A change in the design of the burst pipe safety device and a small change in the software for the operating strategy were able to correct the error.